Vacuum compression moulding presses are state-of-the-art, up stroke hydraulic machines. They are used for moulding rubber, silicone & composites materials. These presses are offered in various capacities ranging from 50 to 500 tons. In these highly efficient systems, the compression takes place in a vacuum chamber where there is closed chamber connected to a pump capable of producing 1 mbar ultimate vacuum. Effective degassing due to the vacuum created around the mould and reduced heat loss to the surroundings make these presses most efficient and effective mode of compression moulding. Vacuum compression moulding presses substantially enhance the moulding quality and increase production up to 50%. In these presses, temperature of the platens is critically controlled with PID type temperature controllers. The machine heating is started automatically before starting the working shift, which considerably saves the pre-heating time. 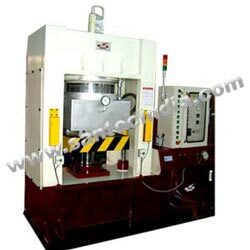 Vacuum compression moulding presses have closed moulding sections with sliding door. These doors get vacuumed during compression moulding operation, where its unique design creates vacuum in press chamber instantly. Vacuum system, hydraulic systems and temperature control systems all are regulated through PLC or programmable logic controls. Complete moulding process is automatic and as the moulding is done in the vacuum, components are moulded without any porosity and with assured quality control.